Out of concern for Andrea’s health, particularly due to immune compromise during Andrea’s chemo, we haven’t gone out for dinner in about five months. That means Christmas, our anniversary, Valentine’s Day, etc… they were all at-home celebrations. My parents took us to celebrate our 11th wedding anniversary and the end of Andrea’s chemo. We had a fabulous dinner at Saint-O in Ottawa’s east end. It was a meal and celebration worth the wait, and the first of what I expect to be a lifetime of celebrations. It was particularly fitting to celebrate with my parents. They’ve been nothing short of amazing to us since Andrea’s diagnosis. They canceled a winter in Florida and kept themselves available to us at all times. The list of things they’ve done for us is long and impressive. Thank you, so much, Mom and Dad! 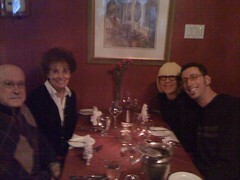 It felt great to be at a restaurant with Andrea (and my parents). I’ll never understand how Andrea soldiered through chemo the way she did. I’m amazingly proud of and inspired by her. Here's to many future celebrations for you all! Great post and great pic. Woohoo! Sounds like a wonderful celebration. I hope there are many, many more in store for you all. Thank you, Greg, Steve, Tricia! So glad you finally got a chance to get out and celebrate. Your lovely partner got through chemo with a veritable army at her side, and from what I've read on this inspirational blog, your coordinating leadership and unflagging support lead the charge. Bravo to you and your blessed family. Thank you, Jenny. Andrea certainly made the role I played necessary and amazingly easy. Hoping we can celebrate with you, sometime, Tim! A huge thank you to our amazing friend, Jay, who hosted yet another fabulous sleepover visit for Lucy and Bayla … and making possible this fun evening of celebration. Yay! Happy anniversary! What a lovely post. Hi lovers! it was the first of many many more celebrations to come. Andrea, i love your hat, which isn't really a hat… you're so creative 🙂 Prenez soin de vous, baisers de France ! Hi lovers! it was the first of many many more celebrations to come. Andrea, i love your hat, which isn’t really a hat… you’re so creative 🙂 Prenez soin de vous, baisers de France !